When do we actually work? Have you experienced the endless meeting? Maybe it’s not just one meeting. Instead, it’s an endless parade of meetings, starts in January and ends in December – starts Monday ends Friday – 8AM to 6PM – back to back to back. Have we become a working culture where the meeting is the work? Is the meeting the only and best tool we have? Consider that a meeting is time and venue for people to assemble, to check status, discuss issues, contemplate futures, make decisions, create new concepts – essentially plan, check, control, report, and innovate. Do we know how to use meetings effectively to meet the various results listed here? Does your organization offer guides on how to conduct these different meeting flavors? Poll your organization, asking them if the meetings they conduct and attend, are effective and efficient. If they are not, then when does the work actually get done? Is it typical for your meetings to start and end 5 to 10 minutes late? Everybody have a conference number, and a moderator code? Should they? Have these become entitlements? Do we use meeting tools like Outlook and PowerPoint effectively, or perhaps even to our detriment? Does your team rely on digital tools, more than or exclusive of analog tools? Are meeting work-products, like agenda, minutes, and a decision log commonplace, and well-managed? What other sort of work products do you have upon exit from a meet? 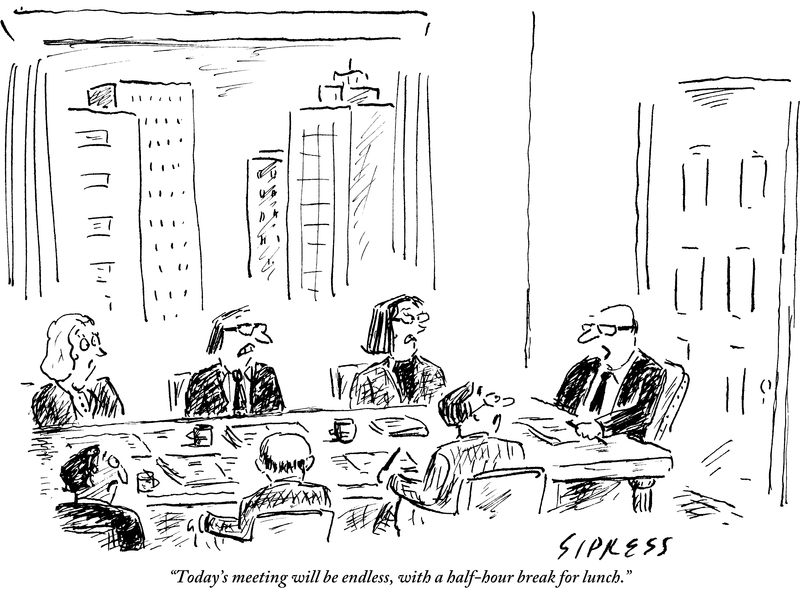 Do we actually need meetings? Is the need to meet (and email and other forms of meeting) a byproduct of how we design our work environments and distribute our team members? Consider that co-location, open floor plans, and specific design of collaboration spaces, contributes to greater productivity in various ways. This art is paid for and used under Non-Exclusive license agreement with Condé Nast.